Maximize efficiency and save time loading and unloading with yard ramps from Copperloy. 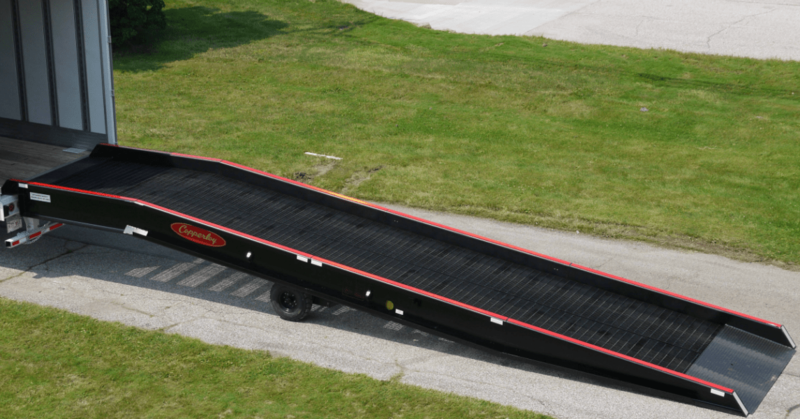 Available from distributors across the state of Virginia, our yard ramps now feature a one-cylinder design that means faster raise time and easier operation. Up to two and half times faster than the average ramp, Copperloy’s redesigned ramps with a centrally located cylinder provide better stability and less chance of tipping. In addition, solid-filled pneumatic tires reduce the chance of punctures. In addition to portable yard ramps, Copperloy produces a full range of high-quality loading dock equipment. Our distributors in and around Richmond, Norfolk and Alexandria can provide you with more information on edge of dock levelers, dock boards, rail boards, and much more. Our products are loaded with industry-leading features and come in a large range of sizes and specifications to match your needs and your existing facility setup.